The new test, according to Diana Bianchi, executive director of Tufts Medical Center’s Mother Infant Research Institute, misses only a very small fraction of Down cases, meaning that fewer women would need amniocentesis. A new, noninvasive screening test for Down syndrome would allow some women with high-risk pregnancies to avoid amniocentesis and in the future may provide detection early enough for treatment to improve some babies’ cognitive function, a Tufts University neonatal genetics expert told a symposium at Harvard Medical School on Tuesday. Physicians recommend that all pregnant women undergo initial screening for Down syndrome, and it is recommended that those with positive results undergo amniocentesis, in which a long needle is inserted into the mother’s uterus to extract cells in the fluid around the fetus. Those alternate screening tests miss 8 percent of Down syndrome cases, however, and also give false positive results about 5 percent of the time. That means that some women may undergo amniocentesis, which, in addition to being invasive, bears a slight risk of causing miscarriage. Bianchi was one of the speakers at “Transforming Child Health through Genome Biology,” an afternoon symposium at Harvard Medical School’s Joseph B. Martin Conference Center that was sponsored by Harvard Catalyst, the clinical and translational science center that supports research across the University. 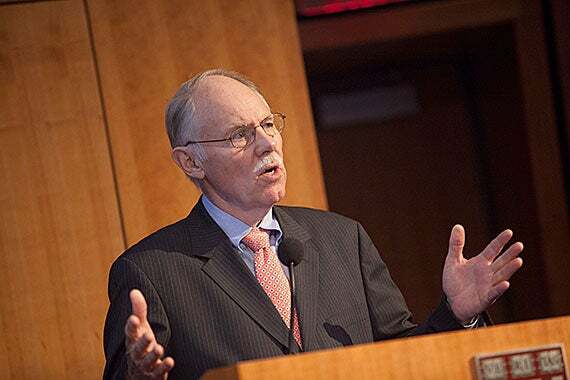 The event also featured Vertex Pharmaceuticals founder and former chief executive officer Joshua Boger, who discussed cystic fibrosis, for which Vertex has a drug on the market, and Associate Professor of Medicine Robert Green, director of the G2P Research Program at Harvard-affiliated Brigham and Women’s Hospital. The event was affected by the ongoing budget controversy in Washington, D.C. One of the scheduled speakers, Alan Guttmacher, director of the National Institute of Child Health and Human Development, had to cancel his appearance. The symposium was opened by Ellis Neufeld, the associate chief of hematology/oncology at Children’s Hospital Boston, co-chair of the Harvard Catalyst Child Health Committee, and Egan Family Foundation Professor of Transitional Medicine at Harvard Medical School, and by James Ware, the Frederick Mosteller Professor of Biostatistics and associate dean for clinical and translational science at Harvard School of Public Health. In his comments, Ware gave a brief history of Harvard Catalyst, which was founded in 2008 as one of 60 centers dedicated to translating research findings into treatments that benefit patients. The program received word in September that its major funding grant, from the National Institutes of Health’s National Center for Advancing Translational Science, had been renewed for another five years. Child Health is just one major focus for Harvard Catalyst, which has programs that address biostatistics, regulatory knowledge, health disparities, community health, clinical research, and other areas. In her presentation, Bianchi described the test and its rapid development, made possible by advances in DNA technology. The concept underlying it was only developed in 2007. The test, first used in 2011, analyzes fragments of fetal DNA circulating in the mother’s blood. The test can be administered earlier in a woman’s pregnancy than other screenings, potentially early enough to allow interventions aimed at improving a Down syndrome baby’s cognitive function, Bianchi said. “We believe improving neurogenesis and cognitive behavior is an achievable goal,” she said. Bianchi pointed out some of the pitfalls to approaches that utilize prenatal screening, including the potential for physicians to learn uncomfortable information, and be faced with the difficult decision of whether to share it. Another challenge, she said, is the pressure not to make a mistake, since some disappointing results may prompt parents to terminate a pregnancy. “You better be accurate, and you better be sure you’re giving parents accurate information,” Bianchi said. Nanotherapy visionary Omid Farokhzad is helping bring to reality nanoparticle-based vaccines that can take the joy out of smoking, reverse allergies, and more.